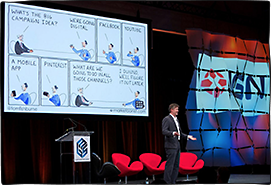 Native advertising is one of the more significant marketing trends of 2013. As consumers get progressively better at ignoring banner ads (or any other ad for that matter), marketers are experimenting with new ways to deliver advertising as content. Native advertising is advertising content that looks like editorial. While flagged as “sponsored”, native ads sport the look and feel of other content in the site. They blur the lines between advertising and editorial. This can take the form of promoted Facebook posts, promoted Tweets, LinkedIn Sponsored Updates, as well as content inside traditional media like Forbes and the Atlantic. Native advertising is nothing new of course. Advertorials and infomercials have been a staple of marketing for years. But native advertising has exploded this year as publishers look for new revenue models and the growth of mobile further reduces the performance of traditional banners. Living in the center of the page raises the bar for marketers. Whether brands will be seen as welcome guests or party crashers depends on the quality of the content they have to share. The tricky balancing act for marketers is to create content that simultaneously brings value to an audience and delivers a branding message. If the content is too promotional, it will turn off the audience. If the content doesn’t link closely enough to the brand, it may not be seen as effective. I’d love to hear your examples of native advertising. Effective native advertising is not only a challenge for the advertiser and the creative agency but also for the media seller who has to put all in line with the willingness of the publisher. In an age of content scarcity, native advertising is just bound to work. Advertorial been there since ages, it’s now online with more flexibility and smart targeting capabilities. I believe it’s important for the marketer to experiment with different ways to introduce the brand in a smooth way. Content syndication for video, articles & photos is a good example. They key is keeping it simple, less commercial with value. Great article as usual, thanks John. I think the most prevalent and valuable form of native advertising is the CPC search ad. If you are searching for something to buy, and someone who sells it offers you a link that takes you right to it, then that is the best link on the page. Disclosure: I work for Google, but I am pretty sure I would believe this even if I did not. 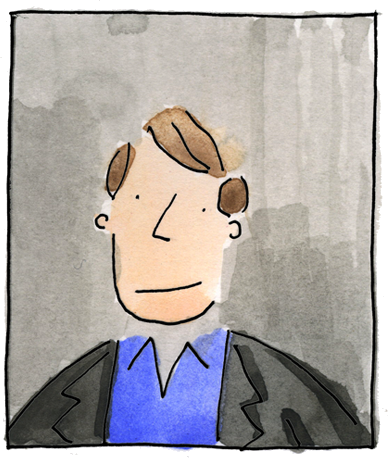 And thanks Tom for the steady stream of cool cartoons and great insight. The trickiest territory to “go native” is social content. 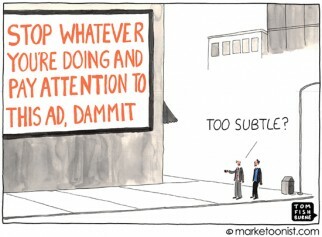 People have very different expectations about the intrusiveness of advertising in the midst of their own conversations. If the reaction on Instagram last week is a barometer, then Brands should tread lightly. You have to create real utility and tell authentic stories to be as you put it, a welcome guest. Video games tend to generate excellent native advertising. They don’t even have to pay for it – their fans do it for free. Whether it is a video of the game itself or creative work that uses the game. However, this is because their brands are interesting. 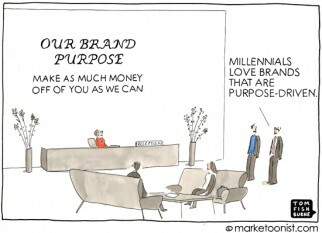 I’m not sure how to generate interesting content for brands that are essentially commodities. 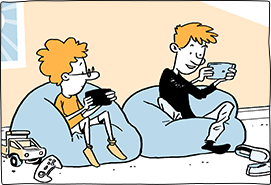 Sorry, I forgot to add that this content does work – it is what introduces my kids to new video games they then ask us to buy for them. 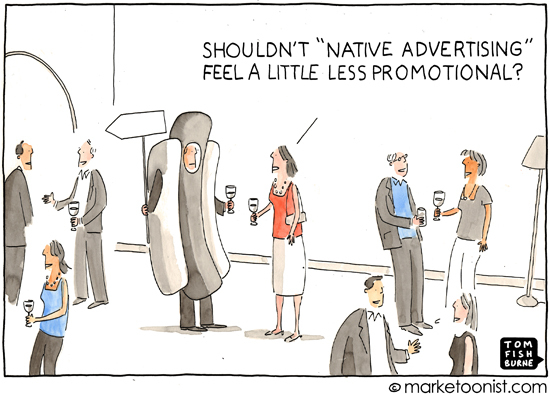 Add “native marketing” to a list of last ditch attempts to hang onto push marketing. Consumers are asking for better pull marketing – marketing departments should listen. As a consumer with a device on my belt capable of answering this need at the point of purchase, why should I waste my time paying attention to any push messaging? I haven’t used the phrase “native advertising” but I sure have used the principle… in the technology world, writing about your product in some detail, explaining it and how clever the technical approach is, not only gets you visibility, it earns you respect. That was somewhat easier when you could write an article and have it published in a magazine that everyone in the industry received. The challenge now is to write that article and have it show up when your natural market is searching for a solution to the problem you solve. I always thought the sponsored ads that attempt to disguise themselves as editorial were more of a filter. And the people who click them are either new to the internet, or just plain naive. Perhaps instead we should call it “Naive Advertising” because, in many cases, it filters the experienced, internet saavy people from clicking. Use naive advertising when you need a pure list of lames. The question I have is whether there are any compelling stats indicating that users repeatedly engage with Native ads (following initial curiosity or fat thumb syndrome). Great as always Tom. Thanks! I think that in addition to Native Advertising, an interesting underlying trend is the move of traditional to create full blown branded content, not only providing the space for the native content, but creating it themselves, something that until a year ago only agencies used to do. These publisher branded content units are taking budgets from creative agencies, which now have to choose whether to create content units of their own, or miss out on many budgets.